كان المحار يستهلك بشكل واسع من قبل الطبقة العاملة. مع تنامي الطلب، بدأ المحار في النفاد وبدأت أسعار ذوات الصدفتين في الارتفاع. اليوم، يعتبر المحار غذاء راق. يمكن استهلاك معظم أنواع المحار وأحيانًا تؤكل نيئة. بشكل عام، فمن الأفضل تقديم المحار الصغير نيء بينما الأنواع الأكبر مثل محار المحيط الهادئ تستخدم في وصفات الطهي. يطهى المحار بالبخار أو الشوي أو القلي ..
و أفضل نصائح طهي المحار هو غسيلة و وضعة في ماء حار مع ملح و خل حتى القلي ، و من ثم وضعه في قدر اخر مع ماء و ورق الغار و هيل و مسمار و دارسين و لومي أسود و ملح و فلفل و ثوم و بصل ، و نبقيه بالطبخ لمدة نص ساعة حتى يتفتح المحار تلقائيا . يعتبر المحار والرخويات من المأكولات البحرية اللذيذة والتى تمد الجسم البشرى بعدد كبير من العناصر الغذائية الفريدة بجانب المعادن الموجودة بها ،حيث انها تحتوى على فوائد صحية كبيرة ،ايضا من فوائد المحار انه يساعد فى فقدان الوزن الزائد ،وزيادة النشاط. تاكد أن تكون القشرة سليمة غير مكسورة وقد تكون مفتوحة قليلا وهذا طبيعي لأن بداخلها كائن حيٌ ولكن إذا ضغطنا عليها قليلا تعود مغلقة . clam is a type of shellfish. Clams can be found in saltwater and freshwater. Clams eat plankton, and are eaten by small sharks and squid. Clams can be eaten by people. They may be found on menus in restaurants that serve seafood. Clams are a fairly common form of bivalve, therefore making it part of the phylum mollusca. There are many clams in the ocean, but some can also be found in some lakes, streams, and rivers. There’s no better way to cook clams than steaming, and the reason is simple. When these shellfish cook, they release flavorful juices. If you steam them with a small amount of liquid, like juices drip down to the bottom of the pot and combine with the steaming liquid to become a shellfish broth with incredible flavor. The resulting dish—shellfish served in its own broth—is so tasty and easy to prepare that the hardest thing about it for most people is finding good, fresh shellfish. Store clams in a cold (32 to 35 degree Fahrenheit) refrigerator in an open container, covered with a moist cloth or paper towels. Kept in this manner, live clams should remain fresh for two to three days. 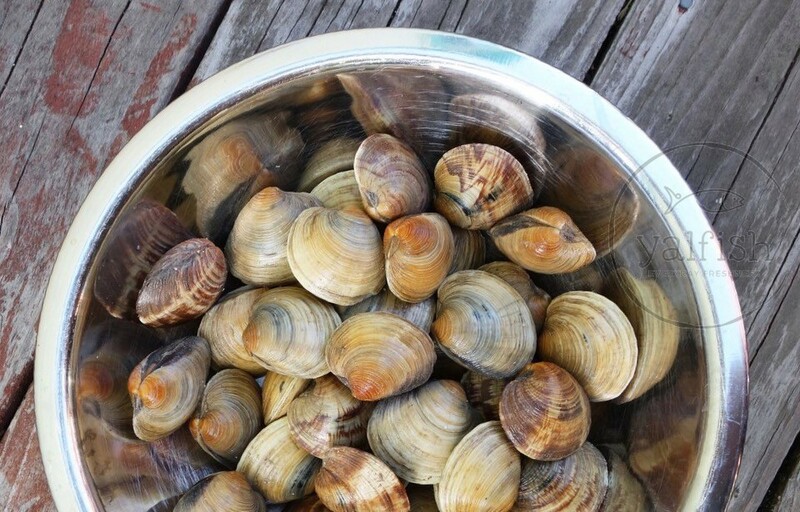 Do not put live clams in an airtight container or submerge them in fresh water; either will kill them. Clams can be frozen either in the shell or shucked. To freeze the clams in the shell, simply place the live clams in moisture-vapor resistant bags. ... To freeze the clam meat, shuck the clams, then clean and wash the meat thoroughly. Drain and pack in freezer containers . كان المحار يستهلك بشكل واسع من قبل الطبقة العاملة. مع تنامي الطلب، بدأ المحار في النفاد وبدأت أسعار ذوات الصدفتين في الارتفاع. اليوم، يعتبر المحار غذاء راق. يمكن استهلاك معظم أنواع المحار وأحيانًا تؤكل نيئة. بشكل عام، فمن الأفضل تقديم المحار الصغير نيء بينما الأنواع الأكبر مثل محار المحيط الهادئ تستخدم في وصفات الطهي. يطهى المحار بالبخار أو الشوي أو القلي .. و أفضل نصائح طهي المحار هو غسيلة و وضعة في ماء حار مع ملح و خل حتى القلي ، و من ثم وضعه في قدر اخر مع ماء و ورق الغار و هيل و مسمار و دارسين و لومي أسود و ملح و فلفل و ثوم و بصل ، و نبقيه بالطبخ لمدة نص ساعة حتى يتفتح المحار تلقائيا . يعتبر المحار والرخويات من المأكولات البحرية اللذيذة والتى تمد الجسم البشرى بعدد كبير من العناصر الغذائية الفريدة بجانب المعادن الموجودة بها ،حيث انها تحتوى على فوائد صحية كبيرة ،ايضا من فوائد المحار انه يساعد فى فقدان الوزن الزائد ،وزيادة النشاط. clam is a type of shellfish. Clams can be found in saltwater and freshwater. Clams eat plankton, and are eaten by small sharks and squid. Clams can be eaten by people. They may be found on menus in restaurants that serve seafood. Clams are a fairly common form of bivalve, therefore making it part of the phylum mollusca. There are many clams in the ocean, but some can also be found in some lakes, streams, and rivers. There’s no better way to cook clams than steaming, and the reason is simple. When these shellfish cook, they release flavorful juices. If you steam them with a small amount of liquid, like juices drip down to the bottom of the pot and combine with the steaming liquid to become a shellfish broth with incredible flavor. The resulting dish—shellfish served in its own broth—is so tasty and easy to prepare that the hardest thing about it for most people is finding good, fresh shellfish.